Now that we are back to daily workouts the increase in exercise is beginning to reflect equally in our appetites here at Casa B.
I am now in the habit of making a large batch of turkey meatballs on a Sunday and Mr B and I will gradually work our way through them throughout the week, whenever we are in need of a clean, low-fat, high protein snack. Below is a batch I just made with a chilli twist. If you are not a chilli fan simply substitute the spring onion and sweet chilli sauce for some finely diced shallots and a few teaspoons of dried herbs. (Oregano, basil and thyme work really well). This would be our usual batch and probably still my favourite but the recipe below makes for a nice change. A high protein, low fat snack perfect for those trying to stay fit and eat clean. Place the turkey mince, spring onion, and garlic in a bowl and mix well. Add the sweet chilli sauce, egg and chilli flakes and mix again. Then add the salt and pepper and breadcrumbs and mix until begins to bind together. Roll into balls, just smaller than a ping-pong ball. Place on your lined, greased tray and bake in the oven for 25-30 minutes or until golden. 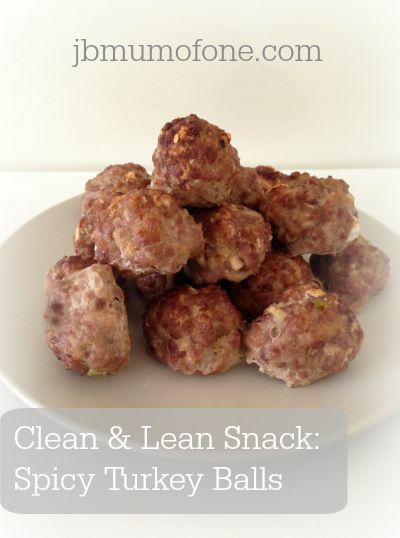 For more great Clean & Lean recipe ideas why not follow me on pinterest? Follow jbmumofone’s board Clean and Lean Diet Recipes on Pinterest.